Living a Fit and Full Life: Jada Toys Nano Metalfigs are a Collectors Dream Come True! Jada Toys Nano Metalfigs are a Collectors Dream Come True! Jada Toys is a leading manufacturer of innovative, highly stylized, licensed toys, games, and collectibles. Jada Toys Nano Metalfigs are a collectors dream come true! 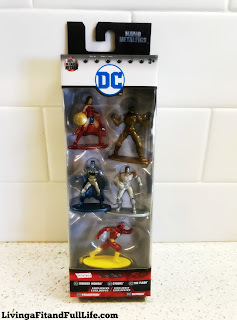 My son is already huge into action figures and with some collectors already in my family I can tell you that these Nano Metalfigs are going to be pretty popular. I love that these Nano Metalfigs are solid and just about unbreakable. This is great if you have kids that also love to play with them like I do. My son absolutely loves playing with these and I love that when he's done playing he can display them on a shelf and they fit right in with his room decor. Jada Toys Nano Metalfigs are awesome and with new collections being released every so often, the collecting fun never has to end! Click HERE to find a store near you that sells Jada Toys! Click HERE to learn more about Jada Toys! Follow Jada Toys on social media!